The Green Party said Ireland is sitting on its hands and waiting for the EU to legislate on plastics. THE GOVERNMENT WILL not oppose a Green Party private members motion which calls for the establishment of a bottle deposit scheme. Speaking in the Dáil today, Taoiseach Leo Varadkar said the previous view of government was the deposit protection scheme being proposed would cost in the region of €80 million to €100 million and would only reduce the use of plastics by around 2%. “Perhaps we are wrong. We have decided to examine it afresh,” said Varadkar. The former Environment Minister Denis Naughten also said bin charges would rise by up to €1 per lift for the green bin collection if a plastic bottle deposit scheme was introduced. He stated the additional charge would be needed in order for private waste companies to recover their losses, adding that such a scheme would only increase plastic collection nationally by 3%. However, Green Party leader Eamon Ryan was highly critical of the government and its intention to abstain on the motion on plastic waste and also for blocking the party’s Waste Reduction Bill going to committee stage. He said Fine Gael had a chance to act but “instead we get prevarication, delays, and paralysis by analysis. We’ve come to expect a lack of environmental leadership from this government but they reached a cynical new low today. They have bottled it on the deposit refund scheme in the same way they abandoned the carbon tax rise”. Ryan added that on the day that scientists are warning us that microplastics are now showing up in the human food chain, the government has shown “their true blue conservative colours”. He warned that Ireland may have to wait for European legislation to “force us to do the right thing”. 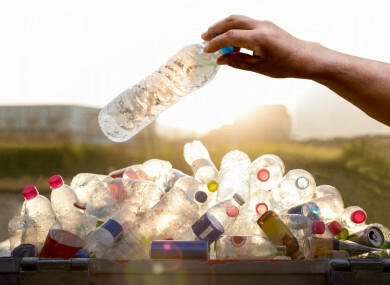 The new Minister for Communications, Climate Action and Environment, Richard Bruton, has said a further study will be undertaken to inform “an evidence-based approach for effective regulatory and policy decision-making in addressing waste from single use plastic items”. The Taoiseach said the Irish government will work with the European institutions to implement a ban and restrictions on single-use plastics. “That legislation is being developed at a European level, and we very much support it and want to be part of it. Legislation is already passing through these Houses to prohibit microbeads. “We are also carrying out an examination of the practicalities of imposing a levy on single-use plastics, including plastic coffee cups that cannot be recycled,” said Varadkar. He committed that Bruton wants to look at the deposit protection scheme again. “He wants to look at it afresh,” said Taoiseach. Email “'Perhaps we are wrong': Government to examine bottle deposit scheme 'afresh'”. Feedback on “'Perhaps we are wrong': Government to examine bottle deposit scheme 'afresh'”.